On this day - July 27, Bulgarian Orthodox Church honors St. Cyril and Methodius, and their most famous students - holy Clement, Naum, Gorazd, Sava and Angelarius - Seven Saints. 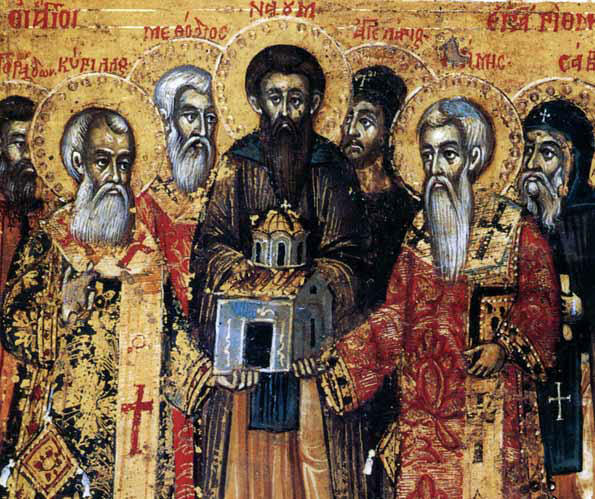 On this day - July 27, Bulgarian Orthodox Church honors St. Cyril and Methodius, and their most famous students - holy Clement, Naum, Gorazd, Sava and Angelarius - Seven Saints. For each of them in the church calendar has its own day, but that day they celebrate together. After the death of Cyril and Methodius other students in the group headed by Clement, Naum and Angelarius flee from persecution and reach Bulgari, which found refuge and support. Bulgarian king Boris I welcome scholars, gives encouragement and state support of their sacred work. There are 2 main educational centers with training schools and scriptoria for translating from Greek into Old Christian literature and its dissemination, but also to prepare priests for the young Bulgarian Christian church. Naum heads the school in Pliska, which was moved to Preslav in 893 and became known as the Preslav Literary School. In 886 Clement was sent to establish a school in the southwestern Bulgarian lands Ohrid (Ohrid Literary School), and even local administrative and military authorities have put in his submission. Life tells him that for seven years has personally trained over 3,500 priests and teachers. It was joined Naum in 893. Thus, for a short time the Greek language in the liturgy and the administration is replaced with local balgarski language understood by virtually the entire population in the Bulgarian lands in those vremena.Den of the Seven Saints.